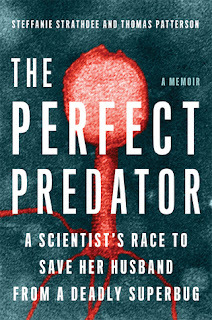 The Perfect Predator: A Scientist's Race to Save Her Husband from a Deadly Superbug by Steffanie Strathdee and Thomas Patterson (with Teresa Barker) is a very highly recommended medical memoir of the fight of a life time that reads like a futuristic fictional medical thriller/mystery. 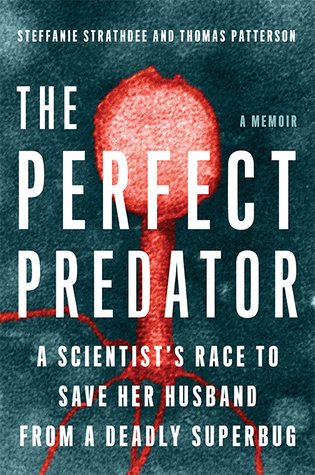 Steffanie Strathdee is a disease epidemiologist focused on infectious diseases, while her husband Tom Patterson is an evolutionary sociobiologist and an experimental psychologist. The "second time around" couple who had been married eleven years, were empty nesters with a passion for travel. Between the two of them, they had traveled to over fifty countries. To plan a trip to Egypt over Thanksgiving in 2015 seemed natural. While vacationing Tom came down with what seemed like food poisoning, but quickly turned critical. In an Egyptian clinic, doctors diagnosed pancreatitis, which was found later to be complicated by a football-sized pseudocyst infected with an antibiotic-resistant bacteria. After two emergency medvac flights, Tom was hospitalized near his home at the UC San Diego medical center. Now Tom was fighting one of the most dangerous, antibiotic-resistant bacteria in the world, and seemed to be losing the battle. After several bouts of septic shock, Tom goes into coma and is placed on a ventilator. There isn't an antibiotic left to treat the bacterial infection and the situation is dire, when Steffanie gears up into professional research mode and pursues the idea that phage therapy could be the solution. She contacts researchers around the world, explains the situation, and asks if they are using phages in their research that could fight the specific bacteria Tom is fighting. Researchers from Texas A&M, and a Navy biomedical center are among the few that step up to help. This is not as easy as it sounds because she also has to go through the FDA for this unapproved treatment. This book is a page-turner and the action is just as heart-stopping as any fictional thriller, perhaps even more so because this is a real life battle. I was totally immersed in the drama of Tom's illness and Steffanie's determination. Most of the story is told through Steffanie's perspective since Tom was out of it or in a coma. There are short interludes of the dreams/hallucinations that Tom experienced while in the coma. In the age of increasing multi-drug-resistant bacterial infections, this case may be singular at first glance, but cases like Tom's will be on the increase. Bacteria are evolving much faster than the development of new antibiotics. Much of this is because of the very real over prescribing and over use of antibiotics. The writing is excellent and clearly presents the story in the sequence of the events as they happened. There is hope and humor in Steffanie's story, as she clearly loves Tom and is devoted to the life they have together. She is also fiercely intelligent. Along with the details of Tom's illness, the history of antibiotics is presented, and her research into phages and how they operate. This is a love story, medical mystery, gripping drama, historical chronicle, and completely captivating true-life story. Disclosure: My review copy was courtesy of Hachette Books.